Brush the eggplant with the oil and place on a cookie sheet with sides. Roast for 20-25 minutes and then turn the rounds over. Sprinkle with garlic and roast for another 20 minutes. While the eggplant roasts, mix the cheeses, except for 1 cup of the Romano/Parmesan. Add the parsley and basil. Mix well. Remove tray of roasted eggplant to a safe working spot. Divide the cheese mixture among the eggplant rounds. Using the back of a spoon, spread the cheese mix as best you can to the edges of the eggplant. 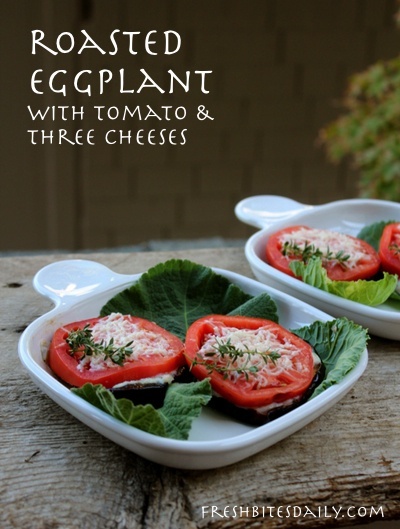 Press a tomato slice into the cheese on each eggplant round. Sprinkle the remaining Romano/Parmesan on the tomato slices. Put the tray back in the oven or under the broiler to melt the cheeses to a bubbly point. Watch for burning. This is too precious a dish to lose it now! Serve immediately with a cold, crisp salad or simply wedges of Japanese cucumber. Roast and freeze the eggplant rounds. They can be frozen in a single layer on the cookie sheets, then stacked in freezer bags for easy handling. 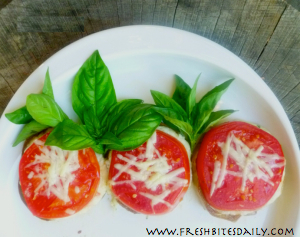 Slice and freeze tomatoes that fit the size of your eggplant rounds. Follow the same freezing procedure as for the eggplant. The cheese mix freezes well. You can make up a mountain of it then freeze in amounts needed for a meal. You will have to thaw out the cheese ahead of time. The tomatoes and eggplant stay frozen until you are ready for assembly. Cook in a 350 degree oven until all is hot and sizzling, about 50 minutes. Finish under the broiler for a bubbly and crusty cheese. Your kitchen will smell like summer garden wonderful. 2 Comments on "Roasted eggplant rounds with Italian cheeses, inspired by leftover lasagna ingredients"
As I look through your recipes, I decided, I could come here daily and pick out my lunch and dinner. Each one of these is calling my name.